For the best tasting smoked foods, your pitsmoker fire should burn hot and clean. A smoldering, cool burning fire will coat the food with bitter tasting, black creosote. Yuk! This page of pit smoker fire tips was created from a question I received through my contact form. The question Tim asked brought up an important aspect of wood-fired pit smoking. Here's the exchange between Tim and I. Having tried several different methods of smoking ribs/meat, I still have a problem of the meat getting TOO black on the outside. I'm currently using an offset smoker and maintain a temperature of 225 degrees when smoking ribs and shoulder. The meat ends up black. Whats up? Since your smoker is staying around 225 degrees, I'll assume that the black color isn't from the exterior of the meat charring. If it is, then you should check your thermometer. It may need to be calibrated or replaced. Otherwise, the black color may be coming from a buildup of creosote. If a wood fire is burned at too cool a temperature, it will create a lot of smoke that also contains creosote. When using wood in an offset smoker, burn a smaller fire and allow it to get plenty of air. A clean flame will give a light clean smoke flavor to the food. You should see only a pale blue smoke exiting from the smokestack. 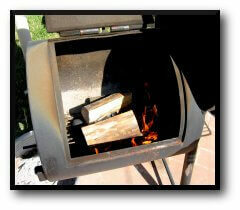 Try using charcoal for your main heat source next time, and adding a few chunks of wood for smoke. If the food doesn't come out black, then the wood fire is the culprit. Some types of wood shouldn't be used in your pitsmoker fire. Stay away from softwoods like pine, cedar and other evergreens. Thanks a TON! I have done testing with a couple different thermometers - I believe I have a good handle on the temp. Yes, I have been burning a low fire with LOTS of smoke -(your exactly right with the diagnosis) the difficulty has been maintaining a fire with air AND keeping the heat down - it seems the second I get a decent fire going - the temp shoots up through the roof. Any trick for me there? I'm glad we found the cause of the problem. Now for the cure. As I said in my last response, the pitsmoker fire needs to burn with plenty of air provided. The trick is to maintain a small fire. In my offset, I get a small bed of coals built in the firebox before I add the food to the smoker. When the coals are to the point they're red hot, I add a small piece of wood (about 6 inches long by 2 inches by 2 inches) on top of them. Then the meat goes into the smoke chamber. I leave the exhaust flue open about halfway, maybe a little less. I leave the intake vents on the firebox open about halfway too. I even open up the main firebox door a little just to make sure the wood I add actually burns a clean fire, and not just smolders. When that first piece of wood has burned down to a hot coal, I add another small piece. This way, I keep a small bed of coals burning constantly, plus there's a small hardwood fire going that provides just a small amount of smoke through the smoke chamber. Tim, give that a try, and experiment with the size of the fire you make. All smokers are different, so you might need to burn either a smaller or a larger fire. The trick is to maintain a hot bed of coals with a small piece of burning wood that is just the right size to keep your smoker at the right temperature. Thanks a bunch... I'll give it a shot and let you know. Thank you for your great question, Tim, and we'll be waiting to find out how your smoked ribs and shoulder turn out next time you get that pitsmoker fire burning hot and clean.